Away from the News of the World's implosion, the latest ABC figures are cause for alarm at the other end of the market as the Sunday quality category fell below two million copies a week in June. In the course of a year the category has lost 8.2% of its circulation - just over 178,000 copies - falling to 1,996,013 copies. The three top titles registered fresh lows, among them the dominant player, News International's Sunday Times, which is flirting with dropping below one million copies for the first time since ABC records began in 1962. The broadsheet shifted 1,000,848 copies in June after a 7.8% year-on-year drop. Guardian News & Media's Observer is also down to 288,928 copies after an 11.6% drop, and The Sunday Telegraph is down to 474,722 copies after a 6.7% decline. In the mid-market The Mail on Sunday retains its stubborn resistance to decline, rising 1% to 1,927,791 copies, but Richard Desmond's Sunday Express is down 4.8% to 539,478 copies. For the red-tops the picture is bleaker, with the category down 6.4% year on year to 4,896,226 copies. 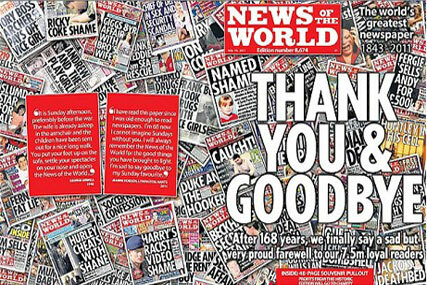 The News of the World sold 2,667,428 of those in its final full month, dropping 5.7% year on the year. Trinity Mirror's Sunday Mirror dropped 5.2% to 1,087,796 copies and sister title The People dropped 8.6% to 474,549 copies. Richard Desmond's Daily Star Sunday fell 13.1% to 305,978 copies.